Belle Hall's different neighborhoods each have their own style. There are walking trails, amenity centers, beautiful views, a crabbing dock and much more to offer potential buyers a variety of different lifestyles. Seven neighborhoods make up the plantation, with starter single-family homes beginning at $250,000 for 1,300 square feet and rising to $1,650,000 for more than 5,000 square feet. Veranda, Rice Bay and Courtyard were the first neighborhoods to be built in the early 1990s and consist mostly of starter homes. Battery Point, with bigger homes and larger lots, was next. Lots are still available in the final three sections of Belle Hall. The Island consists of custom homes built by local contractors. Evian's homes, on larger lots, offer custom designs and finishes, while Hibben has a neo-traditional look. 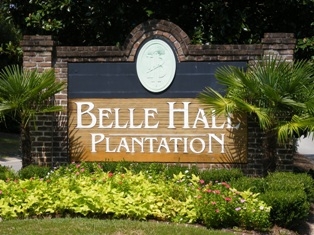 The demand for homes in Belle Hall is still high, and interested buyers can choose from approximately 60 listings. Just off I-526, residents are within walking distance of Belle Hall Shopping Center and Belle Station, which offer grocery stores, a coffee shop, clothing stores, restaurants, specialty shops and services. Belle Hall is convenient for shopping, dining and job access. It is also walking and biking friendly and has great schools.